Get ready for twice the inspiration with this ring set from Apples of Gold jewelry retailer. Influenced by the art deco era, these two rings will leave you equally inspired with their delicate but bold craftwork. Each band is composed of high quality white gold that delivers a radiant glow. 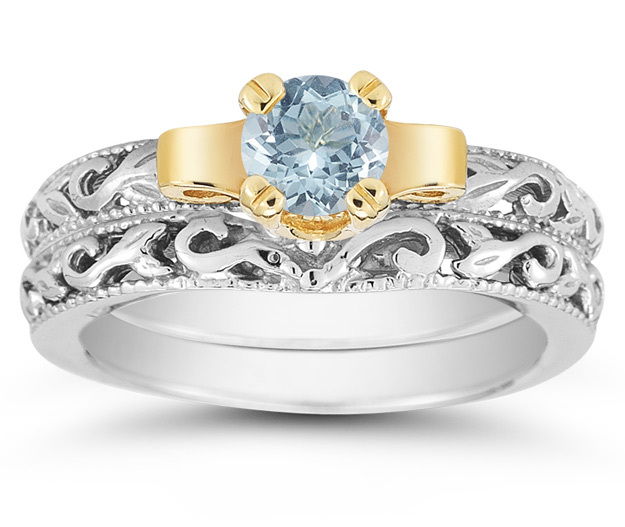 The bands are adorned with careful scrollwork, creating a high style that compliments the aquamarine gemstone which sits center stage. 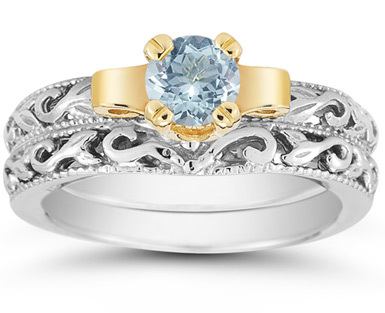 The 5mm light blue stone is set in bright yellow gold and offers a intriguing look for this art deco ring set. We guarantee our 1/2 Carat Art Deco Aquamarine Bridal Ring Set to be high quality, authentic jewelry, as described above.